I thought it was time to include another voice on this blog, so I invited a part-time worker to write about her experiences at the Museum. She is a sophomore History student at Youngstown State University. Her first entry is about the cataloging project we’re doing together. With an open mind I entered the Rose Melnick Medical Museum to report for my first day of work, not truly knowing what to expect. Upon opening the doors I was introduced to the grotesque and almost barbaric looking tools that had been used in the past. Walking through the exhibits, I asked myself “How did people even survive after medical treatment?” Today we are used to the convenience of plastic, disposable tools. In previous years, there were needle sharpeners to reuse needles, stainless steel syringes, and sutures enclosed in breakable glass tubes filled with saline. My job at the museum is to help catalog the museum artifacts into the University Library system. After cataloging, they are placed back in an acid free box and put in a storage room for safekeeping. I’ve learned that someone who catalogs items reflects the ideas of a detective where every small detail counts in the proper identification of an item. A detail could change the whole process of cataloging with just one inch, letter, or small shape. During this endeavor I was able to handle tools from needles to forceps, stethoscopes to eyeglass kits. One of the tools that stands out the most in my memory is a chisel-type tool used to remove part of the mastoid bone. The mastoid is a honeycomb looking membrane that is located behind the ear, near the part of the ear where hearing and balance are located. The membranes tend to become inflamed or infected and can cause hearing loss, dizziness, and facial paralysis. Today this is easily curable with antibiotics, but during the 1920s and 30s it involved a surgery most people cringe to think about. Another tool that I remember is an early instrument used for tonsil removal. Today it is a painless and common operation, but the procedure in the 1940s and 50s was much different. The tool is pretty much a sharp wire that is connected to scissor-like handles. The doctor would just swiftly chop off the inflamed tonsil. No wonder children were scared of the procedure even though they were promised a lot of ice cream afterwards! 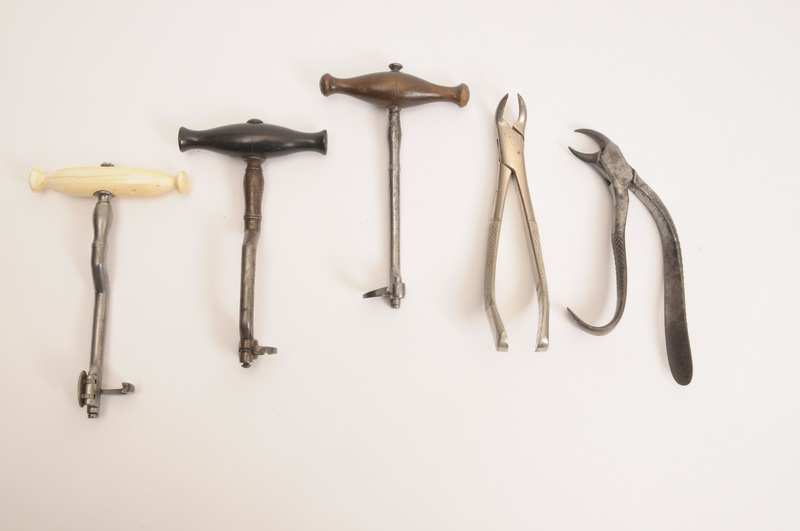 One of the most terrifying tools I saw would have to be the set of old dentistry tools that has retired to the museum. Many people have phobias about going to the dentist or having their teeth worked on, but nothing could compare to the pain people felt at the turn of the 20th century- sharp, steel hooks with knives and tools for carving within your mouth that would be used with little or no anesthesia. Every time I open a box, I experience an adventure of discovering something new, something torturous looking, or simply learn how the tools were used. People that work behind the scenes on projects such as cataloging, help make your museum or library visit a pleasant one and play an important part in preserving the past. Previous Post We’re on YouTube!